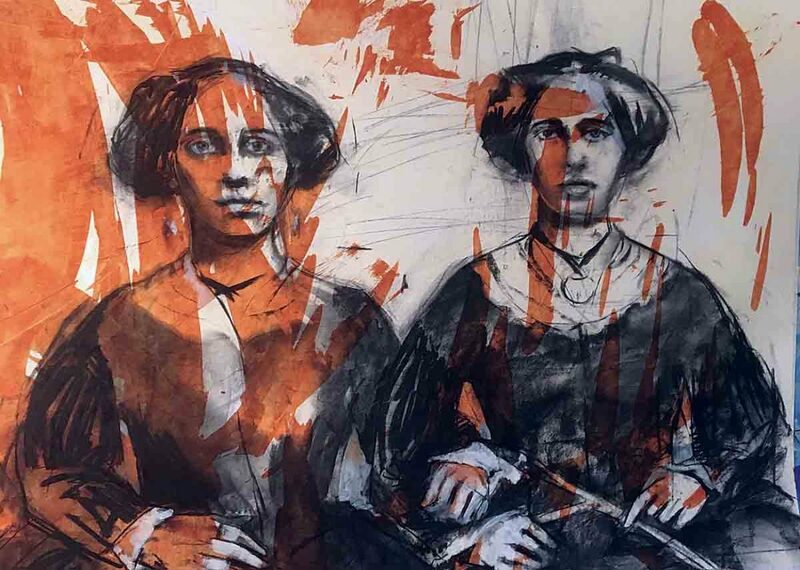 Photo Provided “Sisters,” part of the “Presence of People: A Drawing Exhibition by Beth Nash” at Marietta College. MARIETTA — Two art exhibitions sponsored by the Marietta College Art Department are underway at the college. “Presence of People: A Drawing Exhibition by Beth Nash” is on display in the Atrium Gallery while “Veil: A Painting and Video Installation by Adrienne Tarver” is in Gallery 310. Both galleries are located on the third floor of Hermann Fine Art Center at Marietta College. Receptions for both exhibits will he held 5-7 p.m. Feb. 8. Nash began teaching portraiture at Marietta College in 2001 and continues to teach in the art department. She changed her focus in 2004 to painting, drawing and printmaking with emphasis on the human or animal figure, painting with acrylics and mixed media on wood or paper while experimenting with new media. “Making art has been a part of my life for as long as I can remember. The pleasure of drawing on walls I felt as a child is still with me,” said Nash. As an undergraduate Nash focused on drawing and stone lithography mainly on the human figure. After college she was a portrait artist and began exploring other media as well. “Having always had an interest in fabric and clothing, I developed a line of dyed and painted clothing, which I sold nationally,” Nash said. During the Atrium Gallery reception local favorite Oyo will play a selection of music. Born on the banks of the Ohio River, Oyo began as a weekly jam session at the justAjar print shop in Marietta. “Veil: A Painting and Video Installation by Adrienne Tarver” is on display through April 20. Adrienne Elise Tarver is an interdisciplinary artist living and working in Brooklyn, New York. She has exhibited nationally and abroad, including solo exhibitions at Ochi Projects in Los Angeles; Wave Hill in the Bronx, NY; Victori+Mo in Brooklyn, NY; BRIC Project Room in Brooklyn, NY; and A-M Gallery in Sydney, Australia. She was selected by ArtNet as one of “14 Emerging Female Artists to watch in 2017” and has been featured in online and print publications including Brooklyn Magazine, Blouin Art Info, Whitewall Magazine, Hyperallergic, Ingenue Magazine, among others. She received her MFA from the School of the Art Institute of Chicago and BFA from Boston University and is currently the Director of Art & Design and Director of the HSA Gallery at Harlem School for the Arts in Harlem, New York and Residency Advisor for Trestle Art Space. During the Gallery 310 opening reception, local favorite Oyo will play a selection of music. Born on the banks of the Ohio River, Oyo began as a weekly jam session at the justAjar print shop in Marietta. And like that big muddy river, Oyo is fed by many influences and tributaries upstream – American folk music, bluegrass, old school country, and rock & roll. The Atrium Gallery is open 9 a.m. to 5 p.m. Monday through Friday or by appointment. Gallery 310 is open noon to 4 p.m. Monday through Thursday or by appointment. All exhibitions and receptions are free and open to the public.